(Update: I finally bought another telescope in May of 2011). 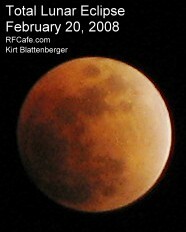 This particular photographic session paid off big-time with some excellent photos of the total lunar eclipse of February 20, 2008. My Canon Power Shot S2 IS digital camera was mounted on a tripod that has been around since my USAF days (1978-1982). All of the images below were obtained using this setup, with only the lens that came with the camera - I kid you not. The only software enhancements made to the images were cropping, resizing, and adjusting the contrast. 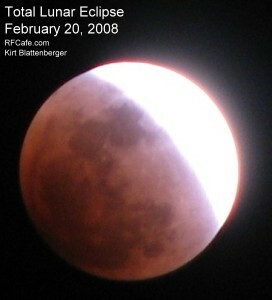 The next total lunar eclipse viewable from North American will occur on December 20–21, 2010. 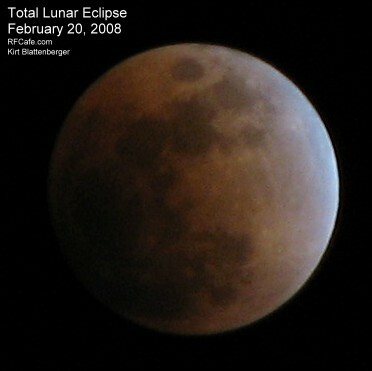 The picture to the right illustrates the mechanism that provides for a lunar eclipse. For a total eclipse to occur, the moon must pass entirely within the area labeled Umbral Shadow - the region where the sun's light is completely blocked by the earth. The Penumbral Shadow region is partially illuminated by the sun, and partially blocked by the earth. The transition of the moon from outside the penumbral shadow into it is not as apparent as when the moon begins to move into the Umbral Shadow. It is the region between the penumbra and the umbra that you see proof that the earth is indeed round, as the picture to the lower right shows. If the earth were not round, that line of demarcation between bright and dim would be much straighter. It does not take a telescope or any type of magnification to ascertain the curved nature of the line, so it is a wonder that the ancients did not conclude the roundness of the earth much earlier than they did. To the right and below it are images of the moon just after it enter the total eclipse phase, at sometime around 10:10 pm EST. The night sky was filled about 80% with low cumulus type clouds that were being driven at a high speed by very strong winds. It was only by having the camera ready on the tripod and snapping lots of pictures during the few seconds that the clouds would clear away that I managed to get these great photos. This one to the right is an unbelievable shot of the entirety of the constellation of Leo, through which the moon - and Saturn by the way - was travelling during this eclipse. The image was adjusted in software for very high contrast to pull out all of the primary stars of the Leo constellation. The entire image was enhanced equally, so relative brightnesses have been preserved. Prior to enhancement, only the moon, Saturn, and Regulus (the brightest star in Leo, just above the Moon) were visible. The bright smudgy area in the lower right is from clouds - not the Milky Way.